“Legend of War Creek” is the fourth book in the Trace Brandon series by Randall Reneau. It all begins with a lost gold mine, initially discovered on August 18, 1882 by Joe La Fleur near the headwaters of War Creek, in the Cascade Range of Washington State. La Fleur actually discovered and lost the mine on the same day. 130 years later the rediscovery of the mine comes with a warning to abandon the Scared Ground of the Dog Soldiers. Geologist Trace Brandon is bold, aggressive, and determined to find the mine and set claims to the area. During the rediscovery of the mine, Brandon finds it guarded by a skeleton with a flint arrowhead imbedded in a femur, and a carved wooden owl-with the admonition not to desecrate hallowed ground. Trace does not pay too much attention to any of the warnings he encounters during the staking of the mining claims, and when the drilling begins, two of his men are murdered in horrific fashion. To make things even worse, Mafia don Peter Pantelli, Brandon’s archrival, plans to take control of the claims by eliminating Brandon and his team. The story is an easy read, and with the quick pace, I found I was at the end of the book much too soon. It is full of action, adventure, mystery, and suspense, along with bits of horror, making for a distinctly enjoyable tale. Trace lives up to the standards of which I placed upon him, his character the most intriguing part of the read. The novel is clearly descriptive of the people, places and events, and a hidden underlying plot is disclosed towards the end. The story is fast paced, with a chain of events that result in an unexpected climax, making it very difficult to stop reading. 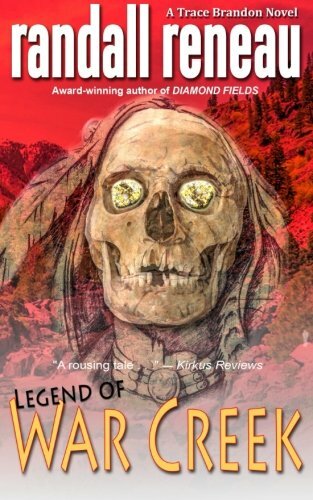 I highly recommend “Legend of War Creek” by Randall Reneau to all mystery/thriller buffs. Fans of the Trace Brandon series will not be disappointed in this latest installment.